At White House event honoring ICE, Trump again said Democrats "just don't mind crime." 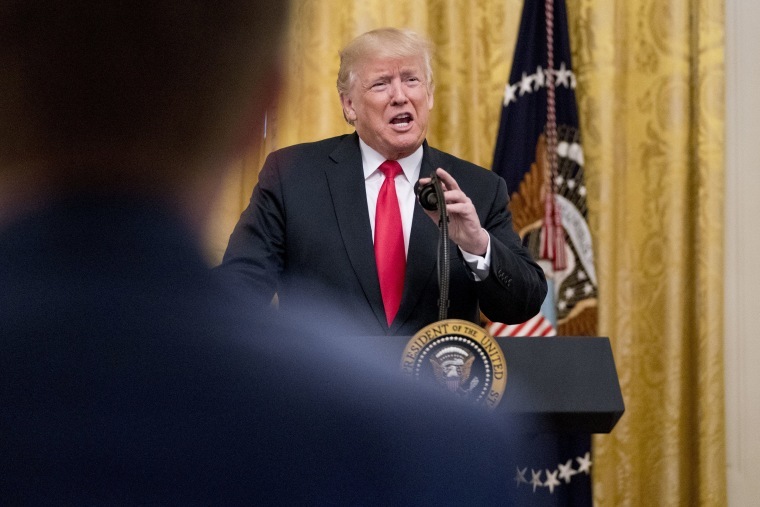 WASHINGTON — President Donald Trump argued Republicans will win in the midterms because Democrats "don't mind crime" during an event on border control and immigration enforcement in the East Room of the White House Monday. "I think we’re going to have much more of a red wave than what you’re going to see as a phony blue wave. Blue wave means crime. It means open borders. Not good," Trump said. "We need new laws. We need border laws, we need immigration laws — we need ‘em fast, we’re going to get ‘em. Hopefully the midterms will help toward that end." Echoing comments he's made on Twitter and at campaign rallies, Trump hammered his political rivals for standing in the way of his efforts to crack down on legal and illegal immigration in advance of November's midterm elections. Though Trump has gone on the offensive against Democrats at a variety of venues — from his frequent stump speeches to a meeting with Russian President Vladimir Putin in Helsinki last month — past presidents have generally refrained from using the White House as a backdrop for bare-knuckled political attacks. "We're building the wall step by step, and it's not easy because we have a little opposition called the Democrats," he said. "I guess they just don't mind crime. They don't mind crime. It's pretty sad." Specifically, Trump targeted Democratic governors, mayors and politicians who have opposed efforts to deport undocumented immigrants, and took particular aim at New York Gov. Andrew Cuomo and congressional Democrats. "Any politician who puts criminal aliens before American citizens should find a new line of work because it’s not going to work," he said. "Any politicians that get up and say that our country was never great — you heard that — I think that’s the end of that career." The last line was a reference to Cuomo, who last week said America "was never great" and then backtracked, calling his remark "inartful." On Monday, Cuomo fired back at Trump. "Any politician who puts children in cages and rips babies out of the arms of mothers is un-American and a coward," Cuomo said. "New Yorkers know who you are, President Trump, and we look forward to seeing to it that you find a new line of work." Though Trump went after Cuomo, his assault on Democrats was much broader. "Congressional Democrats have opposed Kate’s law, have opposed legislation to crack down on MS-13 thugs and have supported deadly sanctuary cities," he said. But even as he offered praise for the officers of the Customs and Border Patrol and Immigration and Customs Enforcement agency — including the observation that one agent he called to speak from the podium "speaks perfect English" — he seemed confused about the name of the former bureau: rather than calling it the "CBP," he referred to it as the "CBC," the acronym for the Congressional Black Caucus.